The garden is bursting with life and in some places it is threatening to take over! 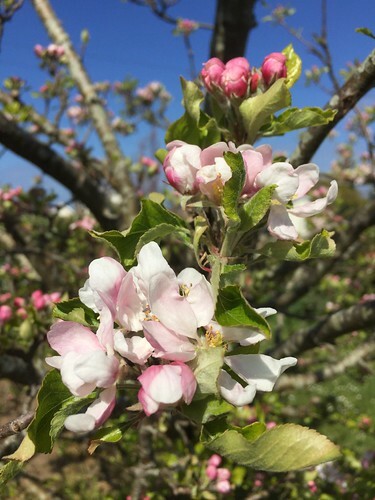 The apple tree is showing off a gorgeous display of blossom. 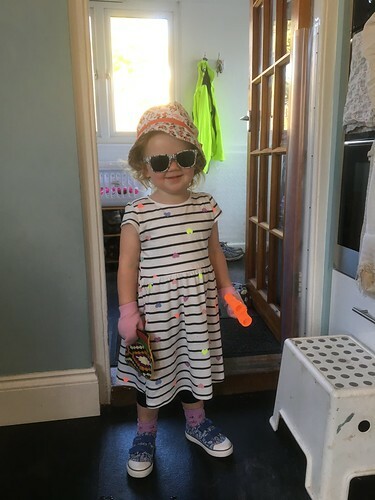 The Little Miss is a fashion legend. Here is today’s offering for pre-school. She’s going to fit right in at Greenbelt. A second day of conference attendance, loads of walking and a little bit of shopping. I am shattered and looking forward to getting home! 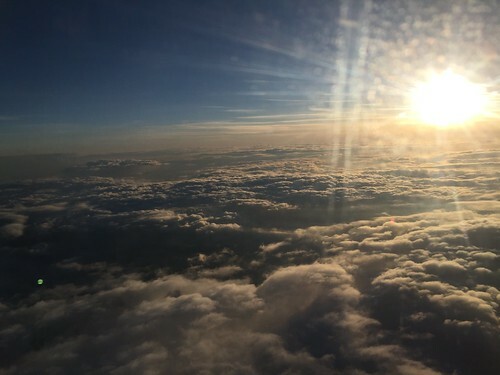 This was the view on the plane on the way home. Gorgeous. I have headed up to Manchester on a work trip and have a brilliant, exhausting and productive day. This evening I went out for dinner with someone I have never met! When I was pregnant with The Little Miss I joined an ante-natal group on Mumsnet. Over time that shifted from Mumsnet to Facebook and there are still about 60ish women on there who share all sorts of things. Over time we have had various meets in different parts of the country and gradually we are getting to know each other better and better. Quite frankly I have discussed some disturbingly intimate things with these women, laughed my heads off at things that have happened and shared joys and sorrows in equal measure. Without a doubt the online world provides friendships of all varieties. These friendships are both real and enduring and I am hugely grateful for them. 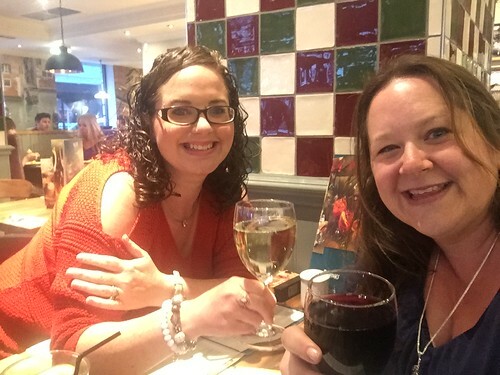 Tonight, I got to spend the evening with one of these wonderful women, we chatted like we have known each other for ages, drank wine and ate some pretty decent food. It was a brilliant evening. We are fortunate to have the most brilliant childminder and she often sends me little videos and pics of what the kids have been up to. 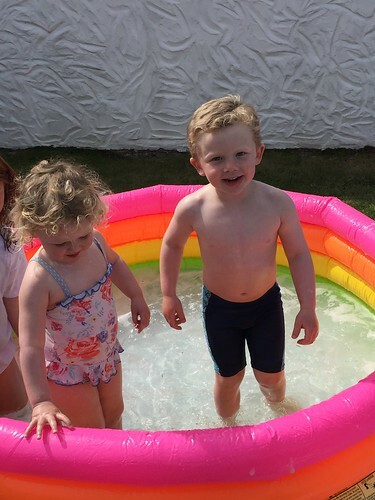 When I arrived to pick them up today The Little Mister was covered in bubbles and sliding down a polythene sheet covered in water. He was having the most brilliant time. Happy children with a happy childminder means I am a happy Mummy! I am so proud of my sister and brother-in-law today. They ran the London Marathon in a time of 3 hours and 36 minutes. 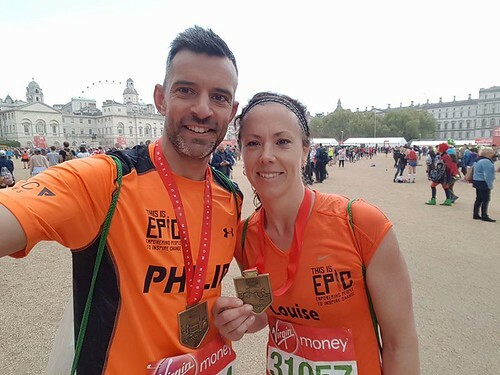 I think they are complete heroes and Philip did a brilliant job of pacing and supporting Louise but I especially think my sister is a legend. She has had a calf injury and has been worried she wouldn’t finish. At about 10 miles in her calf went pop and she took painkillers, walked a bit and then managed to finish the job. My sister is rock hard. Fact. We have had a lovely, busy day. The Mister did a park run, the kids had music lessons and we spent some time in the garden tidying up around the veg patch and getting ready for planting. 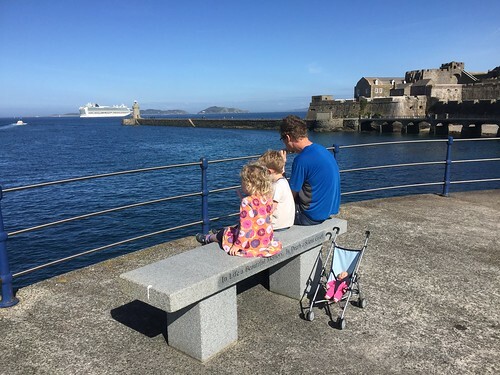 We took a quick trip out for ice-cream and we sat looking out over Castle Cornet and looking at the cruise ship that appeared to be bigger than Herm. 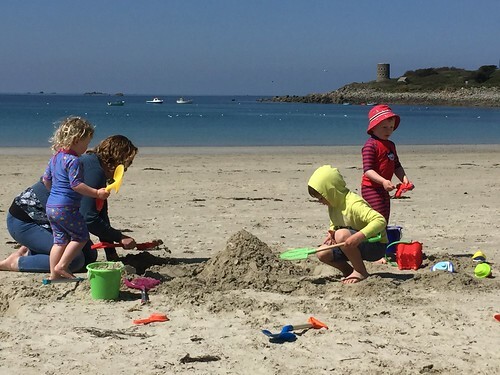 We spent a lovely couple of hours on the beach with friends and their kids. Warm and sunny and lots of snacks. Lovely. The only thing that ruined it was my whinging children refusing to do as they were told! 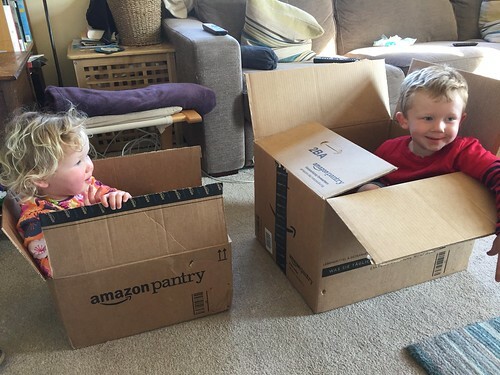 It’s amazing what you can buy from Amazon Pantry these days!!! These boxes are the best toys ever. This evening I managed to squeeze in a quick walk with my sister. 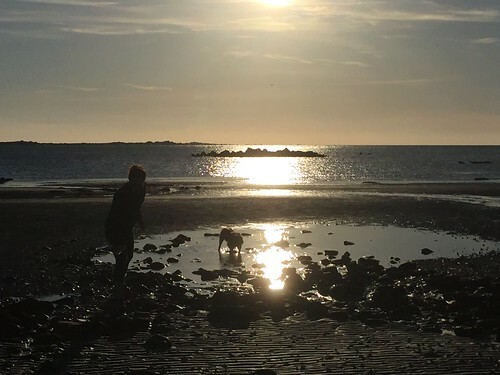 An absolutely beautiful evening down at Vazon beach. A quick tramp across the beach and a catch-up with my lovely sister and her nutty dog. Evenings don’t get better than that.